There’s something to be said for the French who manage to take a trend and entirely reconstruct it so that there is no doubt as to where it has come from. 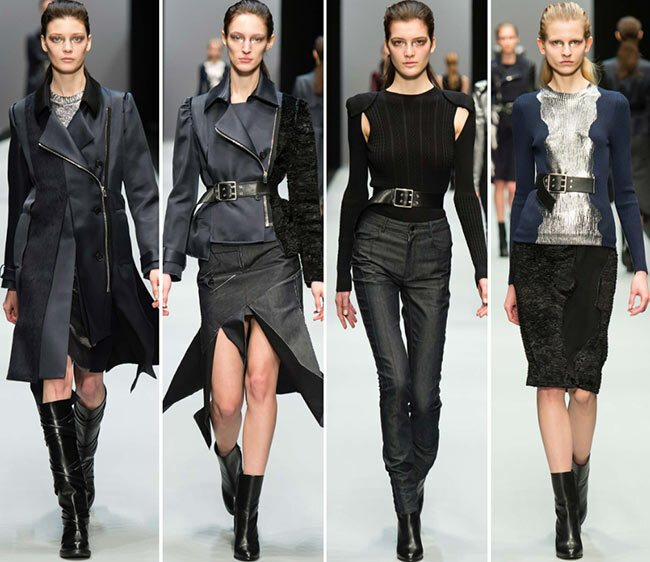 This is the case with the Guy Laroche fall/winter 2015-2016 collection presented on the Paris Fashion Week runway, wherein each of the leather bound and artfully crafted designs has a distinctively French touch to it. It truly is hard not to love any of the Guy Laroche designs, from the haute couture to the more practical women’s daily ready to wear pieces. The creative director of the fashion house has newly been replaced with Adam Andrascik and has been busy the past 6 months putting together a collection that would wow us all. He’s got his own eponymous label as well, and we are quite happy to see him on board the Guy Laroche fashion train. 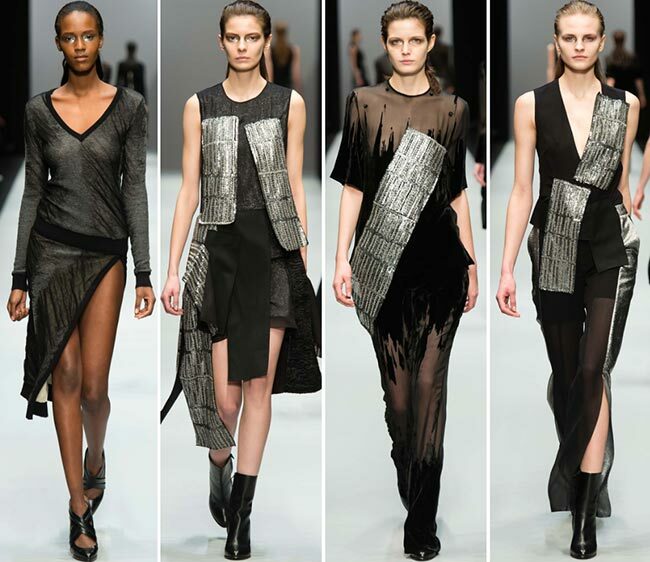 While the company brand is very well known for its perfumes as well, we are certain that the women’s ready to wear collections will be even more popular soon enough, catered to by an ever diligent Adam Andrascik. When asked about the road down which he will lead the Guy Laroche label, his answer is less than satisfying but no less than intriguing; “Dark in a sense because my clothes always are‚Äö√Ñ√∂‚àö√ë¬¨‚àÇ and youthful. There’s going to be an energy to it.’ Considering he’s always admired Belgian and Japanese designers, we can be sure that there will be a great dose of energy in the new pieces and that is the spirit we want to see as well. Black certainly makes the collection, what with the addition of silver and gold metallic assortments added and the white contrasts, while we are also presented with a few gorgeous designs in a lovely navy blue combination. Of these, one particular high round neck sheath dress falling to the middle of the calves catches the attention, with its navy center and the metallic silver sides, shoulders and arms, appearing as if the navy has been haphazardly painted onto a silver sheet of metal. The mahogany colored leather pieces are also just as darkly intriguing, somehow bringing vampires and hunting to mind, both in the same context. 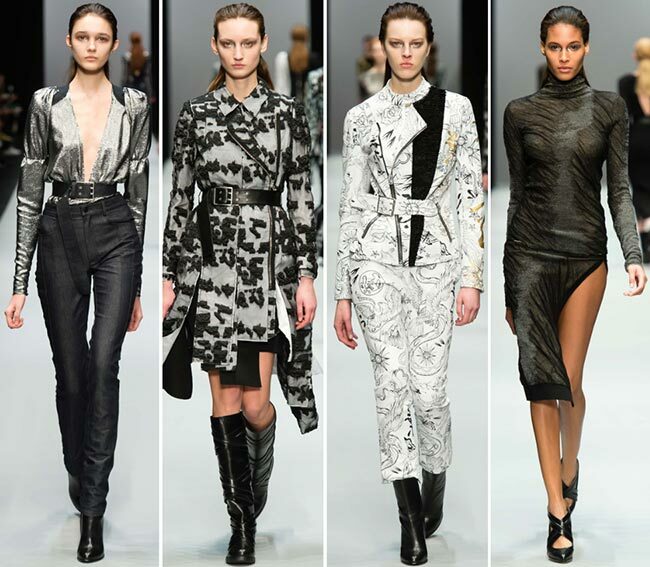 Out of the trends we are faced with here, we have fallen for the black belts with the silver buckles, the ultra-tight leather pants, the plunging deep V-necklines, particularly in the silver metallic shirt ticked into the high waist leather pants and accentuated with the belt, while we find some of the prints seen here especially pleasing, including the gentle floral on white background with a clear black and white pinstripe block on one side of the jacket, as well as the whole multiple slit idea that has turned to many of the skirts into tastefully tattered pieces. Of course, we love the single slits up the thighs as well, as the 2015 trends dictate, while we are intrigued by the see through blouses that barely cover up the bust underneath. 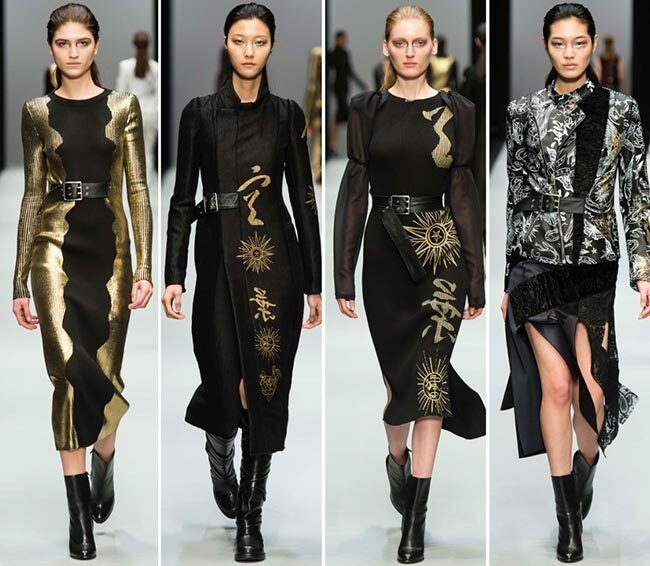 There seems to be a Chinese astrology inspiration in here as well since some of the garments are emblazoned with golden metallic Chinese character prints along with sun and starbursts. 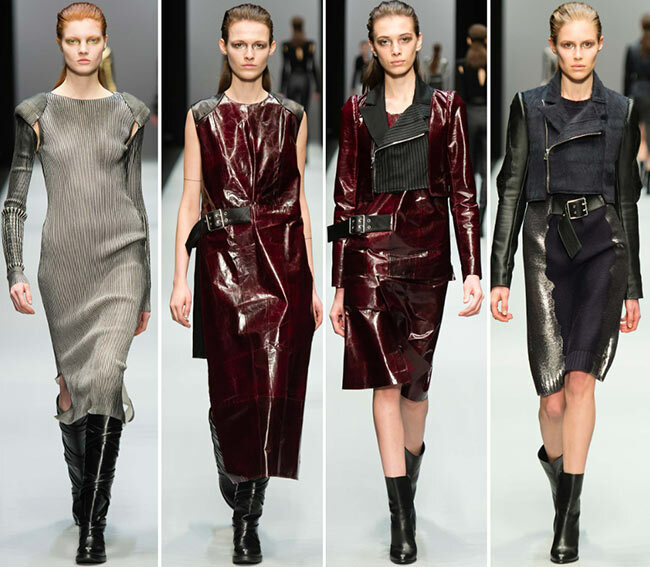 This certainly is a great start for Adam Andrascik and we look forward to his future Guy Laroche collections!